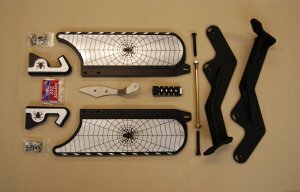 Spyder Parts, Industrial Specialty Company, Inc.
for a new riding experience. 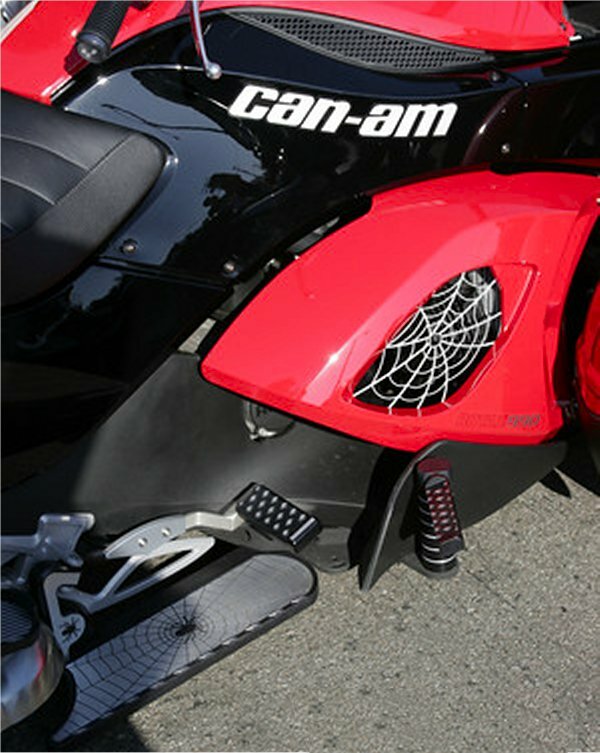 Industrial Speciality Company, Inc. designs customized Can-Am Spyder accessories and parts. These parts are made with the highest quality standards in the industry, custom designed to suit our clients' needs. 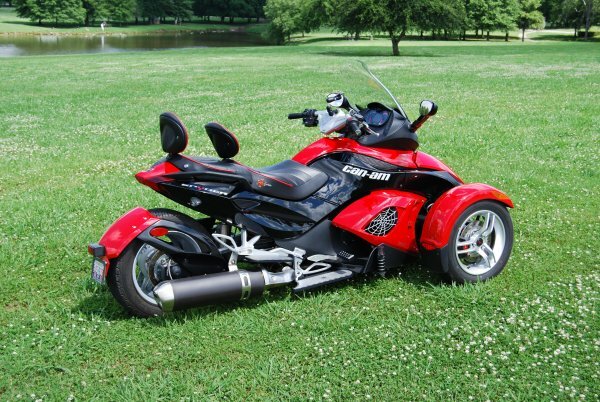 Additionally, ISCI can install your custom Can-Am Spyder parts at our state-of-the-art facility. Have one of these bad boys and need to make a statement? Let ISCI put the "all about me" in your machine. 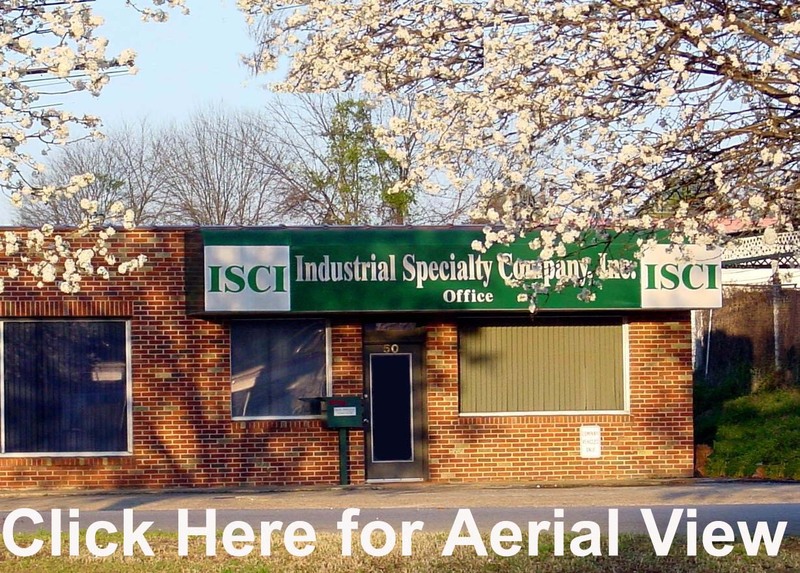 ISCI is a rapid prototype facility that specializes in the process of taking the innovative ideas of our customers and making them a reality. We welcome the opportunity to take your original design and create a finished product customized for you. Bookmark our site as a favorite as more products are sure to follow! 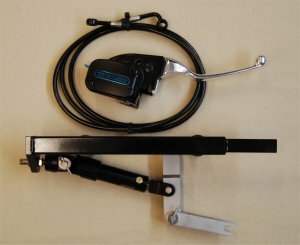 Brake lever shown sold seperately. 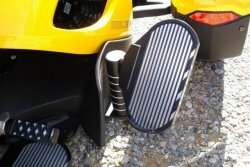 Designed to offer rider the most comfortable ride in relation to positioning of the feet. Can be customized to incorporate different styles upon request. 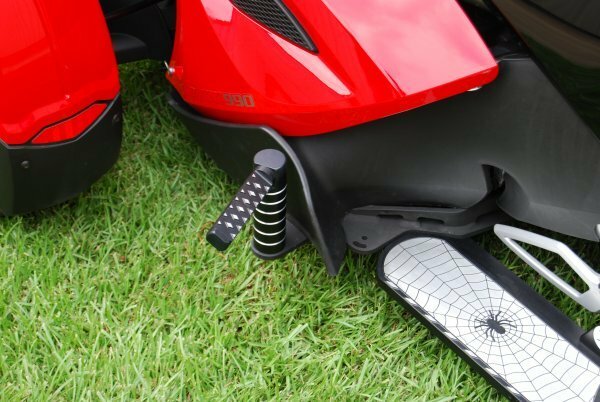 Designed to replace foot pegs. No holes to drill for mounting. Brackets accomodate bolt pattern for Highway Pegs. Machined from aluminum billet and finish is two step anodizing process for contrast. Necessary brackets will be included for mounting. are met with this version. For use on SM5 manual transmissions only. Adjustable for different foot sizes. Compatible with all ISCI floorboard types. Lowers exhaust 2-1/2" at the anchor points. Includes toe stop for non slippage. Floorboard lowered at a 10° downward slope. 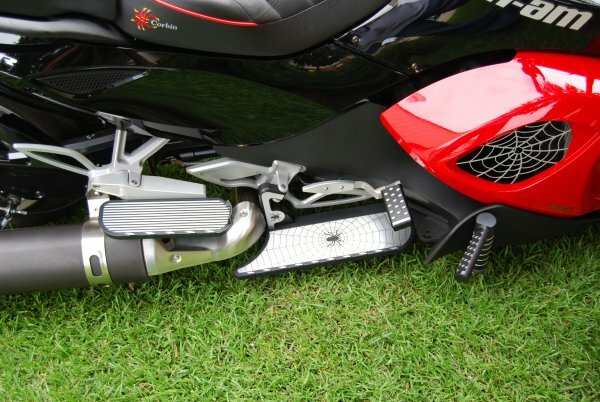 Also available in same Straight Line and Spyder Design Rider Floorboards. Risers installed in two (2) different locations, with a choice of three (3) different heights. Brackets must be used with all floorboards and attachments. Included with all floorboard kits. Bolt to existing floorboard brackets. They offer two very distinct mounting for different size riders. Each location will offer multiple height adjustments for positioning of the pegs. Height adjustors and pegs sold separately. Material is 5/16 inch thick and powder-coated black. Third mounting position available and sold separately. 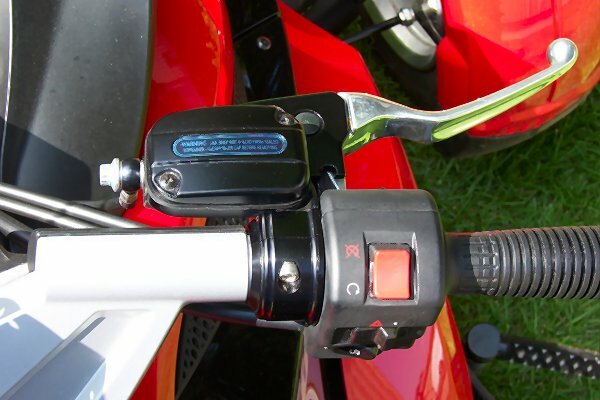 Extension allows rider to sit on bike and release or engage parking brake. Made from aluminum billet with two-step anodizing process for finish. The brake works especially well with our (ISCI) floorboards. No need to even lift your foot off the board to press the brake. Made of 6061 aluminum with a hard coat anodized finish. have after market handle bars. Please specify which you need when ordering. Interchangeable with existing ISCI risers. This like all of our products are made in Alabama with domestic materials and hardware and meets ISCI's quality standards. Features a longer 8-1/2" padded rest. Adjustable up and down a total of 1-1/2" in 3/8" increments. Installation utilizes four existing holes under the seat. Functional with or without Givi bags that use the Givi mounting system, Givi trunk, Corbin backrests and BRP backrests. 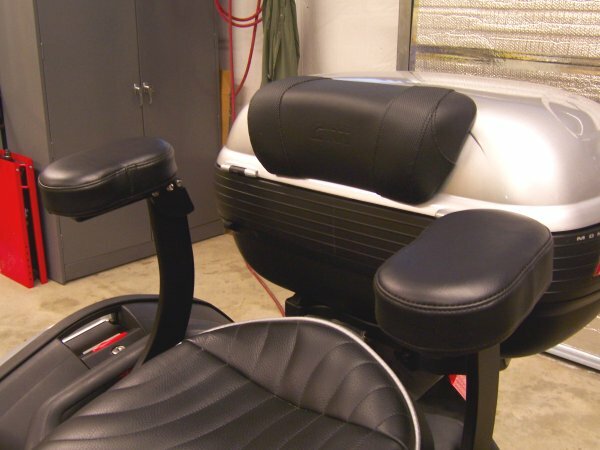 Armrest pads rotate up 100 degrees for easy entry from either side. 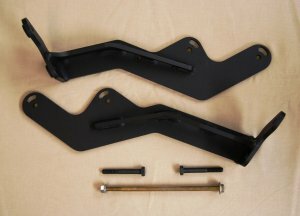 Armrest pad brackets are machined to accept ISCI cup holders. Manufactured from 6061 T6 aluminum with stainless steel fasteners. 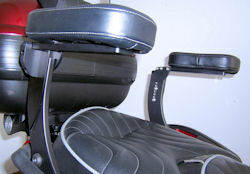 Arm rests to include aluminum parts are anodized black. We have everything installed, floor boards,highway pegs w/risers,parking brake extender and I am so happy with them. Not only are they top quality material and very good looking but they make my ride even more enjoyable. I'm a 68 year old grandmother and have never ridden even a 4 wheeler before I purchased my Spyder and I am truly having the time of my life. Everyone thought I had lost my mind but now when they see me ride they know how happy I am. My 92 year old mother has been really encouraging me. Of course she still drives a car and sells beauty prodcuts so I come from genes that we don't believe in getting old. Will keep checking your web site to see what new products you have coming out, and I am telling everyone I know about them! Thanks to ISCI for manufacturing quality products for the Spyder community. My floor boards and highway pegs are the best purchase made for my bike hands down. I can't wait to see what they come up with next. Dear Mr. Kranzusch - it was a real pleasure meeting you and your staff yesterday. 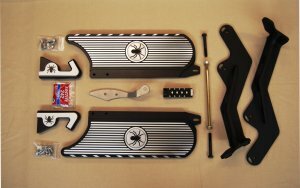 Both Darrell and Billy were very helpful in my selection of your floorboards for my wife’s Spyder and the T-shirt with the Spyder on the back was most welcomed. Jeff did a super job of installing the floorboards and rear brake pedal. He not only helped me to load and secure the Spyder in my trailer, but took the time to giving it a showroom look! 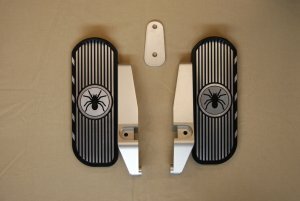 I will definitely consider your company for future purchases and will let other Spyder owners know of your product line. I’ve waited a while before I sent you this testimonial about the floorboards I purchased last month. I wanted to get a few miles on them to fairly evaluate them. These things are the real deal. Its rare these days that you get something that lives up to the old saying of “you get what you pay for”, in this case, in a good way. The design, manufacturing, fit and finish of this product is flawless. I was impressed with the packaging, the attaching hardware and instructions. I’ve purposefully ridden over some varied terrain to see if anything loosens up. Everything is rock solid. I’m proud I made the investment in this product and know they’ll serve me well for many years and miles. As you know I’ve since gotten the Brake Extension and don’t be surprised if I order the Highway Pegs as well. Great stuff. Thank all the team for a job well done. Hi Billy Joe, Just wanted to drop you a line with a big thank you. For a company designing and manufacturing an after market part like your Spyder handbrake assembly, you folks are AAA outstanding.The fit, finish, ease of installation, how it functions and the quality, I think, is better than "factory"option stuff. It is the best money and biggest bang for my buck that I have spent in a long, long time. Thanks again, Billy Joe. Keep the shiny side up. 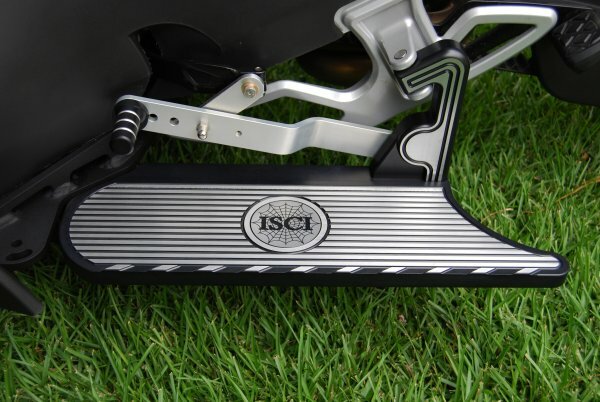 I've been wanting to let you know how much I enjoy all the ISCI products I have installed on my Spyder. Shortly after my first 250 mile ride I knew that I would not be able to ride with the factory foot pegs. My knees just won't bend that far anymore. My wife had a similar problem with the passenger pegs. After extensive research for available fixes, I got lucky and found ISCI. I called and bugged Robert with lots of technical questions. He always had the answers I needed and knew exactly what I was asking. Because I was so impressed I wanted my local Spyder dealer to get on board and become a dealer. I figured it would be a win/win situation so I got them together with Darrell and that's the way it turned out. I have installed the rider and passenger floorboards, the Hi-way pegs, the new dog-leg parking brake pedal and the handbrake. 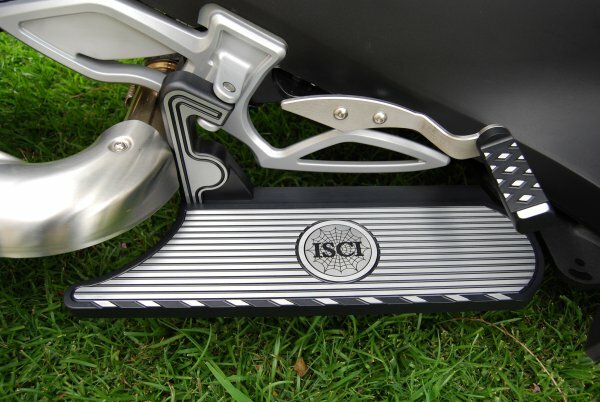 I have consistently found the ISCI products to have better quality control, fit and finish than the Spyder itself. The instructions are well written and easy to follow. I have worked with Robert, Darrell and Billy Joe on install questions, future product questions, sales and general support. They have been an absolute pleasure to work with. I have complete confidence that any ISCI product I buy and use will be the best available. You guys are proof that "Made in the USA" still stands for excellence. I hope to get to the East Coast and meet you all sometime soon. 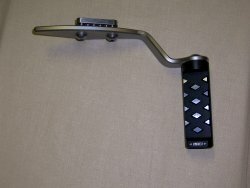 ISCI handbrake shout out - Just want to thank the crew at ISCI for the Spyder handbrake. If you have zero use of your legs or right leg this is the setup to use. Easy install and looks great too. First Class! That's what I'm talking about. Last Wednesday I called ISCI and talked to Billy Joe. 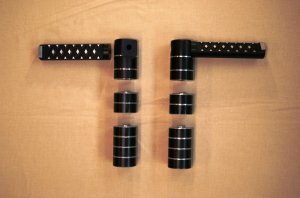 I ordered the highway pegs with risers and brackets to help my legs and knees. I also ordered the handbrake to add safety while my feet were away from the foot brake. Billy Joe informed me that all the items were in stock and could ship the next day. On Saturday I received a hand written Thank You note from Billy Joe. Today, 5 days later I have the items in hand. The product quality appears first rate. I haven't got them installed yet but I am very happy with this buying experience. Thank you ISCI and Billy Joe for providing a superior product and unsurpassed customer service. 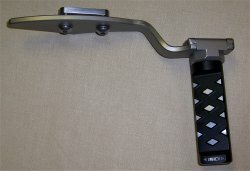 I just finished the installation of my ISCI handbrake. It takes about 1-day. The instructions are quite good and quite clear with good pics. I must say that it is the best mod I ever did. I use the handbrake 99.9% of the time now (having gotten used to it on my BMW K1200GT). The engineering that ISCI put into the thing is simply exquisite. Now that I have my brake, highway pegs are next and I don't have to worry about how to get my foot off of the pegs and onto the brake. My right hand will have taken care of everything. Another advantage of the handbrake that I didn't think of is that now you can push the vehicle from either side. You don't have to worry about it getting away from you. I'd say save up your $1250 and get the mod. It's WELL WORTH IT. I want to add my praise for ISCI and Billy Jones! I ordered a Corbin Smuggler 4 weeks ago from him and just got it yesterday. I had written to ask about the status of the order and he informed me that it had just come in and that he'd ship immediately. When I wrote to ask which carrier he shipped it with he called me so that he could tell me in person. The service I got was personal and great; the support went way beyond most dealers. I recommend ISCI and their service and Billy is a stand-up guy as well. I got the hand brake that I ordered from you. I installed it on my Spyder in two afternoons after work. It was a fairly easy install. I could have done it in one afternoon but I didn't have any dot 4 brake fluid and it was to late to go get some. It works far better than I hoped it would. Seth was right it is worth every penny. I enjoy riding my Spyder more now than I have in the past 2 years. Maybe sometime I can come to your factory and thank you in person. I could not be happier with your products. A. Parker St. Charles, Mo. I have just completed the installation of the floor boards, accessory mounts, and handbrake. I am an experienced mechanic, hobby machinist, mechanical engineer, and a senior executive in a fortune 500 company. I have numerous toys, dirt bikes, buggies, a Harley, and my wife’s Spyder. I buy lots of kits and accessories for my toys. I am very pleased with your kits. With all the kits I’ve installed throughout my life, I’ve never experienced nor seen such superior ingenuity, creativity, quality and precision as I have with your products. Please pass along my comments to your fellow employees and tell them all to take a bow! I’m the kind of guy who always improves on other people’s products, by re-engineering them, adding parts, or just making them better. These kits were perfect! The detail and thought that went into both the products and instructions are exceptional. As I proceeded with each step, I was continuously amazed at how your products matched all the holes and bolts just fit into place. Just fantastic! Simply put, BRAVO! My wife and I have a number of friends and associates who have Spyders. We will be referring them to you. I installed the ISCI hand brake kit yesterday on our new RS-S 2011... What I will say is this. Over the years I have built a few clutch "Slave" cylinders and a few brake assists as well. They work. But the thought/thoroughness of the ISCI kit is amazing. It is worth every penny. 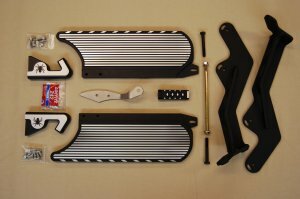 High end parts, detailed and fully complete instructions, and the fit and finish is better than nearly any other aftermarket item I have ever purchased. Heck they even shipped it expecting a gorilla to sit on it or something (There is that much padding). Even the "Lever" itself is high-end! Basically what I am saying is this. Yes for sure I could build my own just like I have before. However in this paticular situation I will be leaving it to the pros and call it a day. My life/property and others I commute with everyday is worth far more than a few hundred dollars in savings... This product is a grand slam in my book.. I have installed the ISCI unit on a RS and RT, and will be adding it to another RT this year. It is a flawless, worry free product, that cuts into nothing, changes nothing, and simply works. IMHO, it is worth every penny.